This ad was found on Craigslist. I could not resist sharing this with you. I remember my mom saving bacon grease in a designated container kept in the refrigerator. I did not take him up on his offer but I did get a nice chuckle from his ad. I'm giving away a jar of bacon grease / bacon fat, from hardwood smoked bacon. I make sure to fry it at low or medium heat so as not to burn the grease. It's a beautiful cream color. It's a great cooking ingredient, but we don't use it in our kitchen. "Bacon butter" or "bacon drippings" are classic with vegetables or Southern cuisine. Many say "You can't fry a potato, season green beans or mustard greens without it." 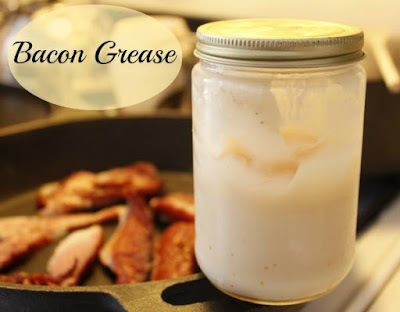 Traditionally, bacon grease is saved in British and southern U.S. cuisine, and used as a base for cooking and as an all-purpose flavouring. Pick up this jar only in-person - I will not respond to texts or large cash offers. Hop on over and "git cookin'" - come and get it. NOW: Call me 8am-9:30pm on my cell phone # [five ten} 8 fore seven - eight oh 15 - first come first served - for free. We always have a container of bacon grease in the fridge but never thought of offering it to someone. Big Dude, We also have a container but I would never give it away or sell it for that matter. Priceless for sure. Greg, I just looked up the video. Now thats funny.